A brief synopsis – After Jim turns it down, Dwight accepts the role of acting manager of Dunder Mifflin Sabre Scranton. Immediately, of course, there are some changes made. Jim pretends to be starting a group called FIST to cause havoc in Dwight’s regimented existence. Everything is just miserable until Dwight shoots a gun next to Andy’s ear. Gabe tries to drive a wedge between Erin and Andy. Andy helps him. The best line – Dwight: [quietly] General meet-and-greet. So I expect you to be on your best behavior, which means none of you will be insubordinate, nor will you foment insurrection. Jim: Question, if we already fomented insurrection, may we be grandfathered in? Dwight: [clears throat] Please take note of the new color-coding system. 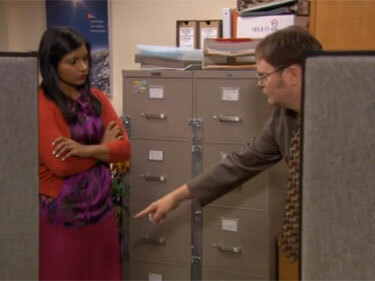 2nd best line – Dwight: [seeing the Join the Fist flyers that Jim is hanging] Hey, hey, hey, hey. What do you think you’re doing? What’s this? What’s the Fist? Jim: Oh, it’s just a social club. You know, like the French Revolution, or the Black Panthers, or communism. It’s just a club. Guys talking, you know. Dwight: You expect me to believe that you’re starting a rebellion? Dwight: Okay, you know what? I would love to join The Fist. The best moment – Angela and Darryl trying to help Kevin enter the 21 digit code for copies is classic in every way. The best storyline – Jim is back to being Jim, at least for a while. Notable guest appearance – Kathy Bates and Cody Horn as Jo and Jordan. Would Dwight have been reprimanded? – Yeah, I think he would have been fired for this one. Had the makings for a great episode that goes awry after the bullet. There just would be no way to hide that kind of incident with back rubs and Jazz Hands. It was great seeing the old Jim, back to his Dwight torturing ways, even with his compliment of Dwight motivating the office into getting everything out on time. I still can’t believe they haven’t hired Darryl as manager. Erin, Gabe and Andy take an annoying turn.